Sour cherries make me happy. One short block from my downtown house, these beauties thrilled me this week: the literal fruit of the work of visionary leaders and dozens of generous volunteers, plus our special expert advisers, Dana and Trudie Reed of Reed Valley Orchard. This young Montmorency cherry tree stands at child height, inviting neighborhood children to pick and taste. This is the year, three years after planting, that the urban orchards in and near the Martin Luther King Neighborhood begin to be what neighbor and visionary urban gardener Sherry Maddock imagined. 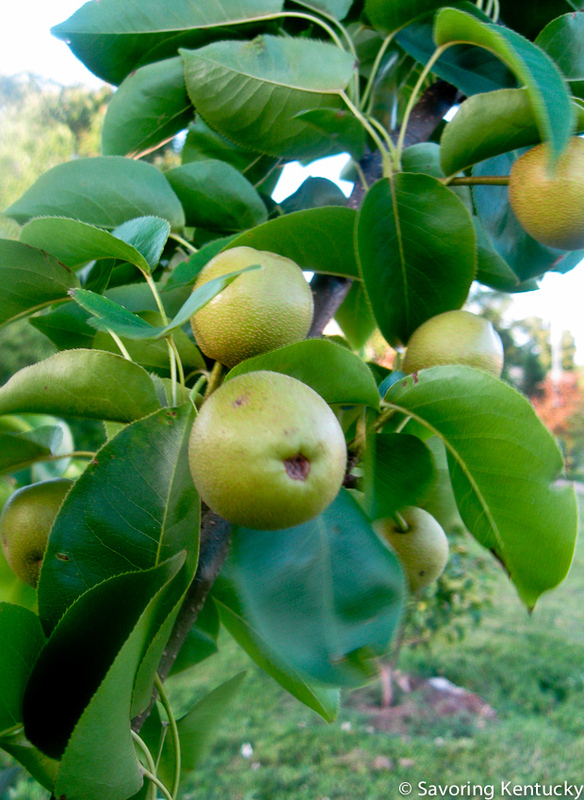 This is the year when cherries, pears, and apples testify to the wisdom of Bob Voll's leadership within Christ Church Cathedral, resulting in church approval for their land to be used for urban gardens and orchards. 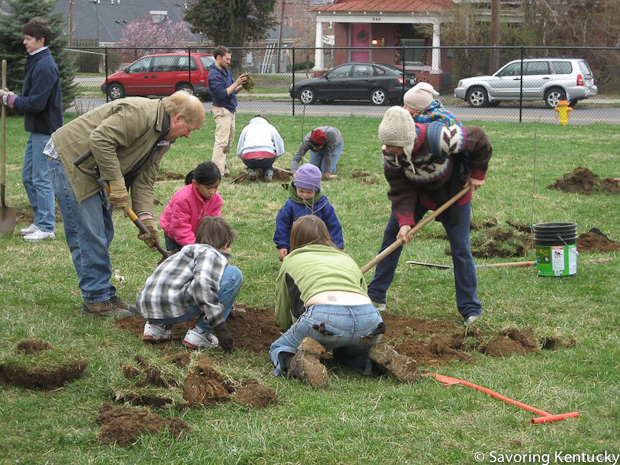 Lexington-Fayette Urban County Government also approved orchard planting on their lands. The first orchard plantings took place where Seedleaf, a break-the-mold organization devoted to nourishing community, got things growing with a supported community garden. That's Seedleaf board member and extraordinary photographer Geoff Maddock,right, with Bob Voll. All the leadership work fired the imagination and volunteer energy of many in the community, who must have been able to visualize ripe pears, apples, cherries, persimmons, blueberries, and hazelnuts when faced with a slender stick that needed a deep hole, carefully dug. Dozens of kind, cold-resistant friends spent hours installing new orchard plantings at the London Ferrill Community Garden, Florence Crittenton grounds, and corner of Elm Tree Lane and Fourth. Here's a before-and-after photo of the Elm Tree Lane planting, shot from two different directions. Three years of nature and nurture make the difference. Picking these beautiful fruit this week, harvesting the benefits of vision and volunteering and nature's abundance, I had a little vision of my own: Lexington and other cities, filled with cherry trees, thousands of them in all our rich but unproductive urban nooks. Apples, pears, persimmons too—fruitful cities. Think of the pies!